Situated across from the Jordan garden, our apiary is home to thousands of honeybees that find endless food sources across Jordan Estate. Created in 2016, the Jordan apiary features seven beehives and a carefully designed bee flower garden. Flow Hives and traditional Langstroth hives are included, allowing our chef to evaluate colony health, bee productivity and honey flavor differences between the two types of hives. 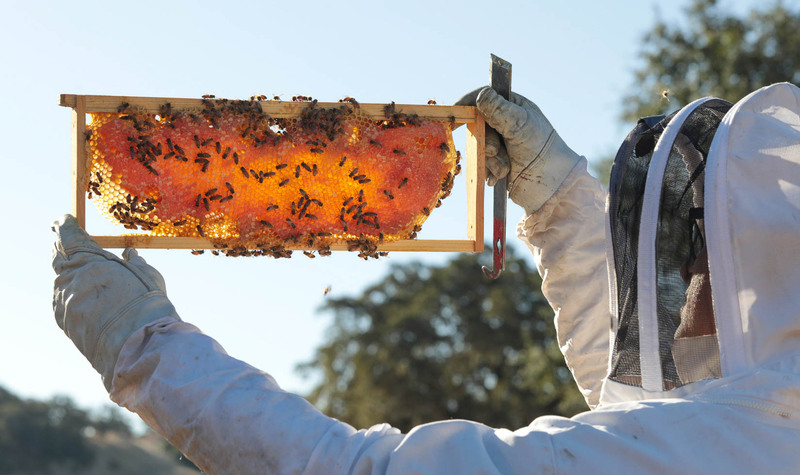 Jordan was the first U.S. vineyard to support Flow Hive, pledging support on the first day of its crowdfunding campaign. We were excited to champion an invention destined to create more beekeepers, increase bee populations and raise awareness about worldwide bee colony collapse disorder. Flow Hive remains most successful crowdfunding campaign ever launched outside the U.S. Although bees are not needed to pollinate Jordan’s grapevines, they play an important role in the annual lifecycle of a sustainable vineyard. Bees are the primary pollinators for cover crops grown between the vines, which naturally replenish important soil nutrients. As bees gather pollen and nectar, they pollinate these crops, making them lush, healthy and able to efficiently return nutrients to the soil. Bees also help other beneficial insects feel safe. Guests can see the Jordan apiary and taste Jordan Estate Honey on the Estate Tour & Tasting and Vineyard Hike experiences.